The Freight swings like it’s never swung before when the Esprit de Django et Stephane Festival sets the stage sizzling with three nights of music and a Saturday open house featuring workshops, performances, and a panel discussion inspired and influenced by the legendary jazz band, Quintette du Hot Club de France. Fronted by gypsy guitarist Django Reinhardt and virtuoso violinist Stephane Grappelli, the Paris-based combo revolutionized jazz in the 1930s and 40s by applying an irresistible, string-fueled propulsion to the more sedate big-band sound of the time. This weekend’s festival showcases some modern heirs of Django and Stephane’s hot jazz sound, including festival house band George Cole & Eurocana who open all three nights of the festival, and Douce Ambiance w/ Bobbi Nikles, who entertain in the lobby before tonight's show. 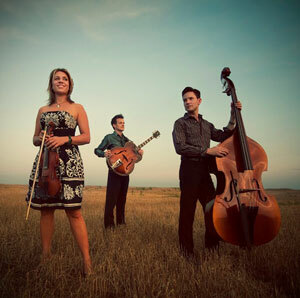 Taking inspiration from the Western swing of Bob Wills and the legendary string sound of Quintette du Hot Club de France, Hot Club of Cowtown plays upbeat, up-tempo jazz with style and verve. “This is a band that could take any venue by storm,” said The Times of London in a review of their show at the Hippodrome this past November. With Whit Smith on guitar, Elana James on fiddle – or, if you prefer, violin – and Jake Erwin on bass, the group sizzles on swing and hot jazz classics, covers contemporary songs like “Long Way Home” by Tom Waits, and stretches out on crafty originals. The musicianship is impeccable, and the occasional vocals add a lovely touch. Whit and Elana met in New York, and after moving to Austin, they crossed paths with Jake and formed the band, touring all over America in a silver Ford van. They’ve opened for Bob Dylan, Willie Nelson, and Roxy Music, and even played in Azerbaijan. (The van, alas, stayed behind.) Their 12th and latest album, Rendezvous in Rhythm, is about ready to be released in North America. For a night of high energy, great chemistry, and masterful chops, come swing with Hot Club of Cowtown at the Freight.